Hopefully the things that begin with t on this worksheet will bring some joyful memories to your kids minds. Camping in a tent, wearing a tie for a special occasion, losing their first tooth, playing with a top or a teapot with their friends, or eating food with tomatoes in them (maybe I’m stretching it with that one….). 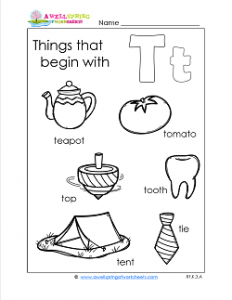 Maybe this will not be a stroll down memory lane, but just an ordinary worksheet with things that begin with t. That’s okay as long as they sound out the t in the words, circle them and enjoy coloring.